Prime Minister Orbán waves to audience following his speech on March 15, 2016 (photo: MTI). 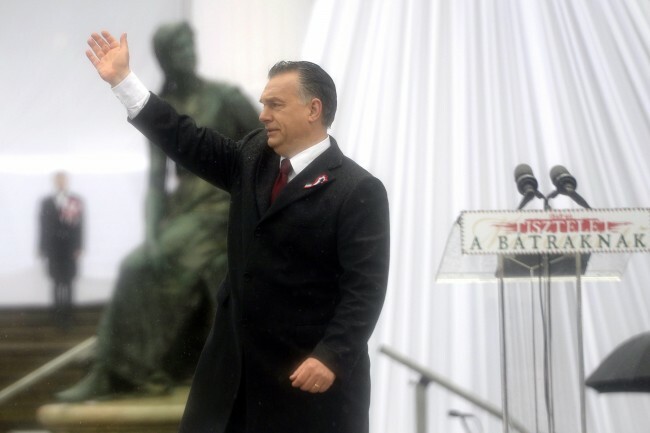 On March 15, 2016, Prime Minister Viktor Orbán delivered his annual speech outside the Hungarian National Museum in Budapest commemorating the anniversary of the 1848 Hungarian Revolution against Habsburg rule. Below is an Orange Files translation of the speech (source in Hungarian). Europe is not free, because freedom starts with the statement of truth. Today in Europe it is forbidden to state the truth. Even if made of silk, a muzzle remains a muzzle. It is forbidden to state that those who are currently arriving are not refugees, but that a mass migration threatens Europe. It is forbidden to state that immigration brings crime and terror into our countries. It is forbidden to state that those who arrive from other civilizations represent a danger to our way of life, our culture, our customs and our Christian traditions. It is forbidden to state that instead of assimilating, those who arrived earlier have built a separate-entry world for themselves with their own laws and their own ideals that pry the millennial European frameworks apart. It is forbidden to state that this is not an incidental and unintentional chain of consequences, but a planned-out and guided action, a mass of people directed upon us. It is forbidden to state that in Brussels they are currently scheming to transport foreigners here as quickly as possible and to settle them among us. It is forbidden to say that the objective of this settlement is to redraw the religious and cultural patterns of Europe, to rebuild its ethnic footings, thereby eliminating the nation-states that represent the last impediment to the Internationale. It is forbidden to state that Brussels is today stealthily swallowing more and more slices of our national sovereignty, that in Brussels many are today working on the plan for a European United States for which nobody ever granted them the authority. Jobbik President Gábor Vona (photo: Orange Files). Hungary is in trouble. How often do we hear this on the street, in our everyday lives, on the television, everywhere. For this reason, this phrase has become worn out, often it means almost nothing―it is an empty cliché. I would nevertheless begin my speech with it: Hungary is in trouble. And what’s more, big trouble. . . .
(For the entire translation, see Gábor Vona Appraisal of the Year Speech—January 31, 2015). —The insistence that “Hungary must develop and independent Russian policy” and “remain neutral” in the renewed conflict between the West and Russia. Prime Minister Viktor Orbán speaking to supporters outside the Hungarian Parliament Building in May 2014 (photo: Hungarian News Agency). Both Vona, as the leader of Jobbik, and Orbán, as the leader of Fidesz, have long articulated these common attitudes and positions (see Follow the Evil Twin). 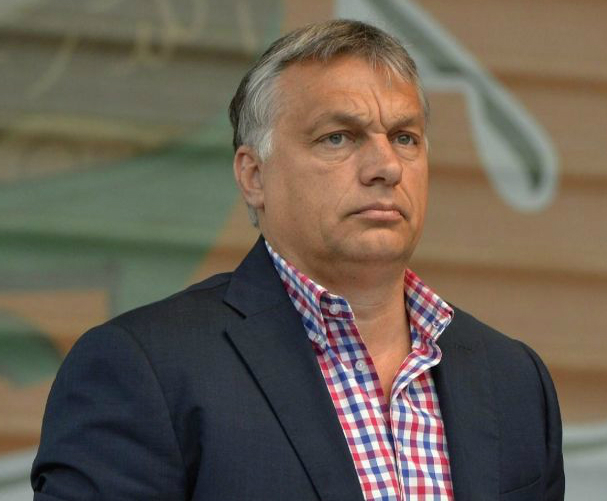 However, the speech that Vona delivered on January 31, 2015 lacked the central element that distinguished the Jobbik president’s previous discourse from that of Prime Minister Orbán: expressions of collective antipathy toward Hungarian Jews and Gypsies (see Notable Quotes: Jobbik President Gábor Vona). 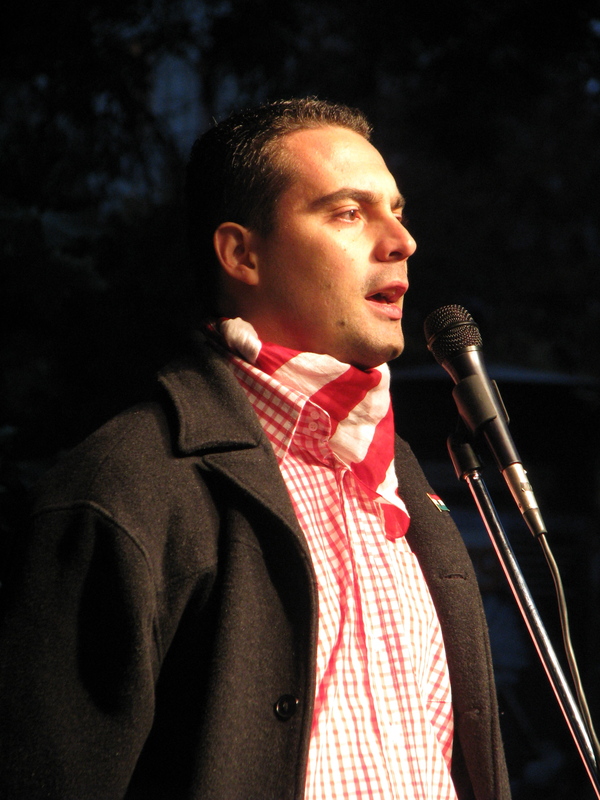 Vona has presumably attempted to divest himself and Jobbik of the mantle of racism in order to appropriate in its full material and spiritual form the political program that propelled Fidesz to landslide victories in Hungary’s past two National Assembly elections in 2010 and 2014, but which the Orbán government has been compelled to moderate considerably over the past few months as the result of pressure from the United States and the European Union, specifically Germany (see Back in the Fold?, The Spectacular Fall and Teutonic Shift). Gábor Vona’s gradual transformation into the leading proponent of many of the Hungarian nationalist tenets and policies that Viktor Orbán skillfully employed to attain an unprecedented degree of power for a head of government in a Western democratic state after 2010 has arguably been one of main factors behind Jobbik’s steady rise to all-time highs in opinion polls since October and Fidesz’s drop to multi-year lows over that same period (source in Hungarian). The phenomenon of a political leader renouncing his formerly explicit racism in order to consolidate his authority is not without precedent in Hungarian history: in his first speech after becoming prime minister in 1932, the former leader of the anti-Semitic Racial-Defense Party (Fajvédő Párt), Gyula Gömbös, declared “To the Jews I openly and frankly state: I have revised my opinion. I wish to regard those Jews who recognize a community of fate with the nation as brothers and sisters in the same way as I do my Hungarian brothers and sisters” (source in Hungarian). And indeed, although he did much to incorporate Hungary into the authoritarian political sphere of Nazi Germany and fascist Italy, Prime Minister Gömbös initiated no measures that served to directly impair the rights or otherwise harm the interests of Hungarian Jews during his four years in office from 1932 to 1936. 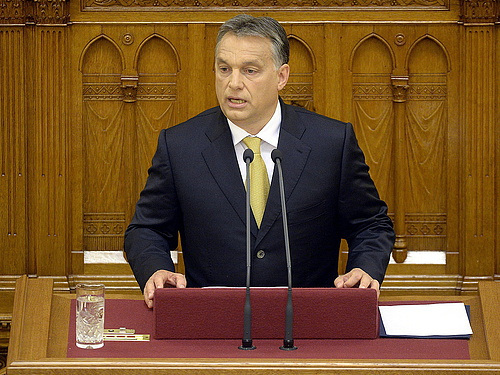 Prime Minister Orbán speaking inside the Hungarian Parliament Building on May 10, 2014. On May 10, 2014, Prime Minister Viktor Orbán gave two speeches—the first in the Hungarian Parliament Building before the newly elected National Assembly after taking his oath of office as head of government for the new parliamentary cycle; and the second immediately afterwards outside the Hungarian Parliament Building before a large crowd of his supporters. 12) The message that Hungary’s population decrease must be reversed naturally, through emphasis on the traditional family. Prime Minister Viktor Orbán speaking outside the Hungarian Parliament Building on May 10, 2014. Below are links to Orange Files translations of the speeches with the portions related to the themes and messages outlined above highlighted. These speeches provide a very accurate reflection of the spirit of the Fidesz system and its architect and unqualified master. These speeches will become increasingly interesting as Prime Minister Orbán transforms the ideas and messages expressed in them into concrete policy and action over the coming years and, perhaps, decades. Speech 1: to the National Assembly inside the Hungarian Parliament Building (source in Hungarian). 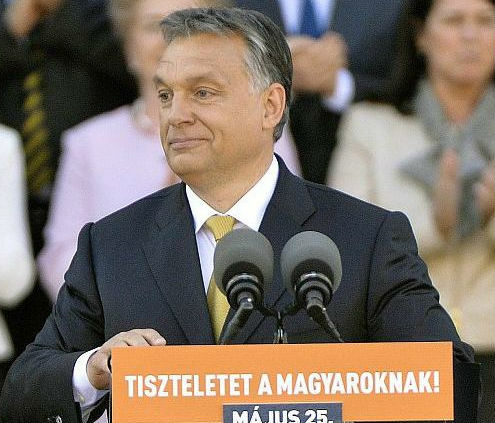 Speech 2: to supporters outside the Hungarian Parliament Building (source in Hungarian). 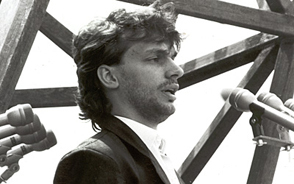 Viktor Orbán speaking on June 16, 1989. Since the beginning of the Russian occupation and the communist dictatorship 40 years ago, Hungarian people once had an opportunity, once had adequate courage and strength to attempt to reach the objectives articulated in 1848: national independence and political freedom. To this day our goals have not changed, today we still have not relented on ’48, just as we have not relented on ’56 either. Those young people who today are fighting for the establishment of liberal democracy in Hungary bow their heads before the communist Imre Nagy and his associates for two reasons. We honor them as statesmen who identified with the will of Hungarian society, who in order to do this were able to relinquish their holy communist taboos, that is, the unquestioned service of the Russian empire and the dictatorship of the party. For us, they are statesmen who even in the shadow of the gallows refused to stand in file with the murderers who decimated society, statesmen who even at the cost of their lives did not disavow the nation that had accepted them and placed their confidence in them. We learned from their fate that democracy and communism are irreconcilable. We know well that the majority of the victims of the revolution and the retribution were young people of our age and kind. But it is not only for this reason that we feel the sixth coffin to be ours. Until the present day, 1956 was our nation’s last chance to step onto the path of western development and create economic prosperity. The ruin that weighs upon our shoulders today is the direct consequence of the fact that they suppressed our revolution in blood and forced us back into that Asian impasse from which we are again trying to find a way out. It was, in truth, then that the Hungarian Socialist Workers’ Party deprived us, the young people of today, of our future. It is for this reason that not only the corpse of a murdered young person lies in the sixth coffin, but our next 20—or who knows how many—years lie in there as well. We young people do not understand many things that are perhaps natural for the older generations. We are at a loss to explain how those who not long ago stood among the chorus vilifying the revolution and its prime minister have today unexpectedly realized that they are advocates of Imre Nagy’s reform policies. Neither do we understand how those party and state leaders who commanded that we be taught using textbooks falsifying the revolution are today jostling to lay a hand on these coffins like some lucky talisman. We believe that we owe no gratitude for the permission to bury our dead after 31 years. Nobody deserves thanks because today we are able to operate our own political organizations. It is not the merit of the Hungarian political leadership that it has not acted against those demanding democracy and free elections, though the weight of its weapons would permit it to do so, using methods similar to those of Li Peng, Pol Pot, Jaruzelski or Rákosi. Today, 33 years after the revolution and 31 years after the execution of the last legitimate prime minister, we have the opportunity to peacefully achieve all that the ’56 revolutionaries attained for the nation through bloody conflict, if only for a few days. If we believe in our own strength, we will be capable of bringing an end to the communist dictatorship, if we are sufficiently resolute, we can force the ruling party to submit itself to free elections. If we do not lose sight of the principles of ’56, we can elect for ourselves a government that will initiate immediate talks regarding the quick withdrawal of Soviet troops. If we have the mettle to want all this, then, but only then, we can fulfill the will of our revolution. Nobody can believe that the party state is going to change on its own. Recall that on October 6, 1956, the day of László Rajk’s burial, the party newspaper Szabad Nép proclaimed in colossal letters on its front page “Never Again!” Just three weeks later, the communist party’s ÁVH officers opened fire on peaceful, unarmed demonstrators. Not even two years later after the “Never Again,” the HSWP sentenced innocent hundreds, among them their own comrades, to death in show trials similar to that of Rajk. It is for this reason that we cannot be satisfied with the promises of communist political officials, promises that oblige them to nothing at all. We must ensure that the ruling party cannot use force against us, even if it wants to. There is no other way to avoid more coffins and overdue funerals such as today’s. Imre Nagy, Miklós Gimes, Géza Losonczy, Pál Maléter, József Szilágyi and the nameless hundreds sacrificed their lives for Hungarian independence and freedom. Young Hungarians, before whom these ideas remain inviolable to this day, bow their heads before your memory. There is a striking similarity between the conflict-centered, aggressive rhetoric of Orbán’s iconic Imre Nagy eulogy and that which he uses today as the head of the Fidesz–Christian Democratic People’s Party government. Only the objects of his antagonism and sympathy have changed in the two and a half decades since the 1989 speech. The Orbán of today would not classify “Russian,” “Asian” and “Li Peng” among the former, just as he would not classify “Western” among the latter. However, the speech still represents one of the greatest instances of twentieth-century Hungarian political oratory, boldly and explicitly articulating the widespread antipathy felt in Hungary at the time of the System Change toward the Hungarian Socialist Workers’ Party and the role it had played in the suppression of the the 1956 Hungarian Revolution and the post-revolutionary campaign of retribution that entailed the execution of Imre Nagy and hundreds of others.